Our methods leave guaranteed results in cleaning the upholstery and getting rid of the deeply settled-in dirt and dust. 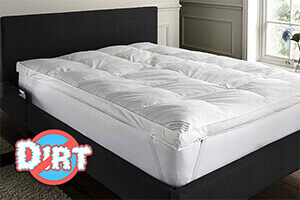 We will remove every stain, dirt, dust or bed bug that dwells in your mattress. Our steam machines achieve excellent results and the chemicals we use are efficient, while non-toxic at the same time. The fabrics will not be subjected to damage, but even in the rare case of this happening, all of our cleaners have liability insurance that will cover it. We can easily treat curtains as well. Although this is not an easy process, our experienced technicians are experts in the field. We have full insurance if something goes wrong. Our tools and detergents are appropriate for different kinds of fabrics: Polyester, Cotton, Silk, Satin, Flax. We take care of both synthetic and natural materials, without harming the delicate fibers, print or pattern. Our steam and washing machines are always the latest technology. We use eco-friendly products that do not endanger the household environment. Our experts can do a wonderful job in cleaning the curtain, at prices that will not burden your budget. By making the prices affordable and the schedule – flexible, we have become one of the companies that offer high-quality services. With our round-the-clock customer support and easy booking process, you can make a reservation without any hassles or complications. If you want your Mattress & Curtains cleaned regularly, we offer contracted regular visits, whereas the frequency will be suited to your preferences and liking. We operate in London and have fully equipped teams of professional co-workers who are trained and certified in-home sanitation. Customer support service is at your disposal every day, all day long. You can use the phone, e-mail or contact form to make a reservation or ask a question.